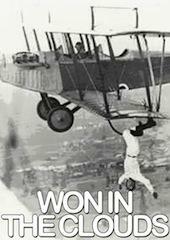 Won in the Clouds is a classic movie from the silent film era. This1920s feature is action-packed. The death-defying aerial tricks and stunts by the famous pilot Al Wilson are on full display. Wilson plays himself and launches to the rescue as a beautiful heroine (Helen Foster) is kidnapped. There are villains, brawls, and stunning aerial scenes. It includes captivating glimpses of not only early aviation technology but also innovative piloting. The bulk of the picture was mostly shot in the clouds. The midair fistfight is not to be missed! The heroic figure of Al Wilson and his feats are absolutely arresting in this skyward, fun-filled adventure.